"Incredibly comfortable!" Finally I can wear a professional shoe without sacrificing comfort. Wolf & Shepherd Reviewed by Trevor G. on May 21st . Wolf & Shepherd was founded in 2014 by footwear designer and former decathlete, Justin Schneider, who set out to create the world’s most comfortable dress shoes. Drawing on his experience as an athlete and shoes designer, Justin began to design dress shoes that would satisfy the sartorial requirements of today’s men while providing superior comfort and performance only found in high-end athletic footwear. The company even made major headlines in 2016 when a competitive runner set a world record for “The Fastest Half-Marathon Won in Dress Shoes” while wearing a pair of Wolf & Shepherd Cap Toe Oxfords. The popularity of Wolf & Shepherd’s particularly comfortable dress shoes helped fuel the company’s rapid growth since its founding in 2014. Today the company offers a full line of comfort-focused footwear that consists of dress shoes, loafers and boots. The shoes themselves are designed at the company’s headquarters in Los Angeles, California, and crafted in Portugal using premium Italian calf-skin leathers, as well as Parisian waxes and other high-end materials. Each pair of shoes incorporates Wolf & Shepherd’s patented Comfort Technology which gives the shoes their superior comfort that the brand has become so well-known for. You can continue reading our full Wolf & Shepherd brand history or simply scroll down to learn about the company’s current line of shoes and where you can buy them. If you’d like to learn more about a particular shoe mentioned above simply click on the link to jump straight to it. Otherwise, continue reading below to learn about all of the shoes. 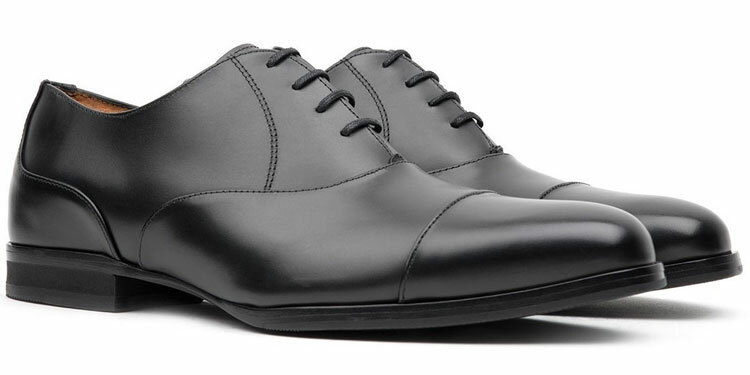 The Closer is a classic cap-toe oxford and is one of Wolf & Shepherd’s best-selling dress shoes. It’s a particularly versatile shoe that can be easily incorporated into a wardrobe that features formal attire and is as comfortable as it is sleek. The Senna Wingtip combines traditional characteristics with contemporary design elements for a truly unique shoe. It’s a great semi-formal dress shoe that can be dressed up or down depending on the occasion and your specific needs. The Gunner Driver by Wolf & Shepherd is a driving loafer with superior comfort at its heart. The perfect for shoe to go with semi-casual attire. Where Can You Buy Wold & Shepherd Shoes? The best place to buy Wolf & Shepherd shoes is on the company’s official website at wolfandshepherd.com. Wolf & Shepherd is primarily an online retailer, however you can purchase their shoes at a select number of men’s tailors and shoe retailers with physical locations throughout the United States. You can see a full list of Wolf & Shepherd retailers in the United States here. There are plenty of important factors to take into consideration when investing in a new pair of men’s dress shoes. The style of shoe, the quality of the material, and the method of construction are just a few things to think about deciding which shoes to invest in …but what about comfort? Unfortunately, lots of men sacrifice the comfort of their own feet when buying dress shoes in an attempt to be frugal. But what if you could get all of the benefits of a premium men’s dress shoe (design, craftsmanship, etc.) without compromising the comfort of your feet? Well, that’s exactly what Justin Schneider thought when he founded Wolf & Shepherd in 2014. Before launching Wolf & Shepherd Justin worked in the footwear industry designing high-performance athletic shoes for top brands. Drawing on his experience as a former collegiate athlete and his skills as a shoe designer, Justin set out to create “the most comfortable dress shoes in the world” by combining the of a premium dress shoe with the comfort and performance technology of athletic shoe. In June of 2016, a 23 year old by the name of Juris Silenieks won the “Hotlanta Half-Marathon” in Atlanta, Georgia while wearing a pair of Wolf & Shepherd dress shoes. In doing so, Juris set a world record for the “Fastest Half-Marathon Won in Dress Shoes,” which garnered a great deal of press coverage in the running world as well as the shoe industry.